Tazza D’Oro Crowns a Champion! After two days of intense training with Oliver, Emily organized another Tazza D’Oro Latte Art Throwdown. We had a great turnout and several coffee rock stars showed up representing the best of the best in Pittsburgh – Aldo Coffee and 21st Street Coffee and Tea – read what they are saying about the throw down. We had 12 (count em) competitors – 5 from Tazza D’Oro (Emily, Braden, Zach, Tone, Chase), 5 from Aldo Coffee (Rich, Belle, John, Lauren, Frank), Luke from 21st Street and a regular at Tazza D’Oro, Matt and a pot worth 60 bucks. 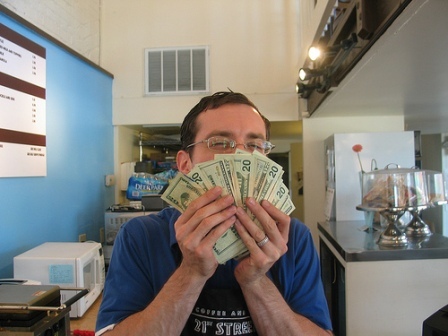 And the new Champion of the Tazza D’Oro Latte Art Throwdown is…. LUKE!!! Our new champ won 36 bucks and a day off and Emily took 2nd place with 24 bucks and no day off. Oliver, Kevin and I were banished to a table away from all the action because we had the distinguished pleasure of being the judges. To me it felt like 2 hours of paper work! We were grateful for the pizza and beers. Rich, Melanie, Luke and Alexis your presence at Tazza D’Oro meant a lot to us because we think you are awesome business owners and coffee fanatics – thank you. That was fun! Rich, thanks for taking the pictures, I especially like the main caption! Check em out folks –flickr. Hah! Nice picture of Luke! Congrats, Luke, congrats to all. Thank you Amy and Tazza D'Oro -- we are all so much richer for knowing you. What a fine organization you have: an inspiration to all of us, in every way. I knew that picture would come back to haunt me someday- that was so funny I LOL'd. Great work with the party- we had fun and it was nice to meet the whole Tazza D'Oro crew. I was kinda nervous using your GB5- I had never touched one before and I thought I was going to blow up the milk with all that steam power! We'll have to host a little event sometime in the Strip. Thanks again! Thanks, Melanie and Luke, I'm glad you LOL'd about the picture. When I found it that was the only one for me! Based on Luke's victory, and being in the Strip early before Tazza had opened, I decided to try 21st Street Coffee. I'm pleased to say it was really good - the La Tortuga is a good blend, and the shots were almost as good as Tazza D'Oro's. Nice that you can finally get good coffee in the Strip! Tazza D'Oro's still the best, but kudos to 21st for serious coffee.